The OWASP Serverless top 10 project has launched. The upcoming report will evaluate the Top 10 for serverless environments, explaining and demonstrating the differences in attack vectors, defense techniques, and business impact. Join us for this webinar to learn about what might be the biggest change...& the most concerning – injection attacks. 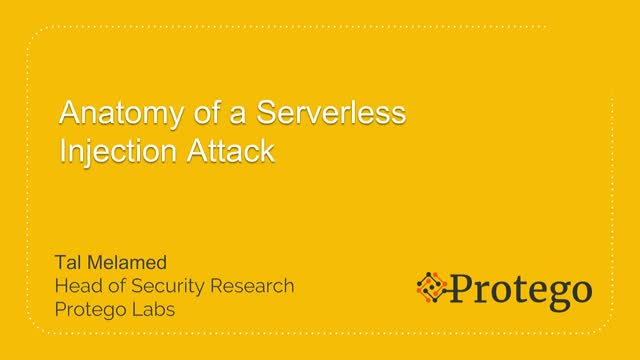 Protego’s Head of Security Research will show you what a serverless injection attack really looks like using code regularly found in the wild. - Does serverless make sense for startups? - What’s the best approach for large enterprises? Visit the summary on our blog and you can also listen to the audio. “Serverless” is more than a contentious buzzword. This new application architecture can solve problems, such as filling in IT gaps quickly, at a low cost. Whether you’re considering deploying serverless apps, or they’re creeping into your infrastructure anyway, join us for this interactive webinar. We’ll cover some of the key advantages of serverless tech, as well as the new security challenges you need to be aware of. This episode of the Serverless Show, features serverless expert Yan Cui. Topics include the changes in company culture driven by serverless, Google Cloud Functions, the pains going from containers to Kubernetes to Serverless, and other conversations we wish we weren’t having. For this episode of The Serverless Show, Hillel and Tal from Protego Labs were joined by John Visneski, Director of Information Security & Data Protection Officer at The Pokémon Company International. The group discussed the use of serverless at Pokémon, serverless bitcoin mining attacks, the pervasive vendor lock-in conundrum, the impact of serverless to security, and finally favorite tweets, including one in which Hillel was called out for spreading bullsh**. • How are people moving to serverless? • As Amazon dominates serverless, are you locked in? Join us for this informative session and you’ll understand the critical importance of least privilege in this differing threat landscape, and many solutions you can implement immediately. Join us for this informative session and you’ll understand the differing threat landscape, as well as many solutions you can implement immediately.